Visual cues are visual elements you place on your map that help players learn how to move about your map. You can also use visual cues to grab the attention of players to important features on your map. They can be used to warn players of hazards, such as boundaries of the play area. And visual cues can be used to manipulate a player’s perception to see what you want them to see. Some visual cues are used to help players understand how to navigate your map with less effort on their part. In level design practice, lights shining through a doorway help you see that there is a doorway down the hall even if you cannot see the doorway itself. The light also acts as a means to attract you to the doorway, a way to help you know where to go next. 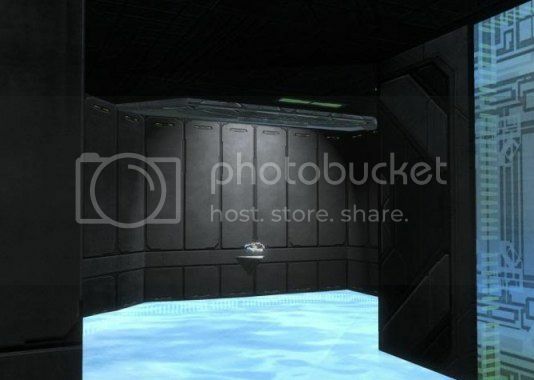 In Halo, lights tend to bleed through the walls, so instead of using lights, you might try using a change in the pattern of the flooring that alerts a player that there is a new Path opening to take. This is very important for long Walkways where you can see the far end but not necessarily any side openings due to the Architectural features. If you have a repeating pattern of struts protruding from the structure along one side of the Walkway, and between two of them you have a doorway hidden behind the struts, you want to give the player standing at either end some indication of the door’s presence so they can evaluate the risks and their options more correctly. You can do this by some visual cue in the flooring or above the doorway itself. The point is you don’t want to hide the doorway in a pattern, but instead draw attention to it through a subtle cue. In level design practice, when you want a player to move along a Path in a field, you cut the Path out using sand, dirt, or pebbles. People will see the Path cut through the grass and naturally think that they need to follow the Path to get somewhere they should go to. Until Halo forge evolves into a full terrain editor, the lines and patters on the skins of the blocks are a good substitute. The lines or patterns on a block’s surface can be aligned to the predominate Path that runs over that block, to aid the player in understanding that there is something in that direction, or that the intent is for them to move in that direction. You could use visual cues to point players to power weapons, or other valuable pick ups on your map. This is where light can be useful if used carefully. Light, such as the animated light of a receiver teleport, can be used to grab a player’s attention and draw them to the power weapon. 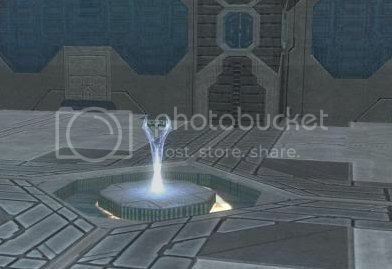 I used this technique in Reach, where the energy sword appeared to spawn out of the white flame from the floor. It gave a visual cue that would grab the player’s attention, and gave the spawning of the sword a reasonable context (e.g., the sword didn’t just spawn in thin air). I have seen some other examples of how light is used to show case a weapon in a dark room. However, if you use a weapon spawning system (depends upon the title you are forging for), your weapon may have a way point indicator that simply draws the attention of the players for you. We will talk more in depth about the way point indicators for weapons later. We can also see examples of how the Publisher uses light as visual cues in teleports, grav lifts, and man cannons. Each uses a bright light, and each adds to the attraction by animating their light. In the case of the grav lifts and man cannons, the animation of the light is also a visual cue as to the direction of travel. In the case of the teleport, the light at the sender node is quite different than at the receiver node to offer the visual cue that it can send. And the visual cue of the complete absence of light indicates an incomplete teleport channel configuration. Safe Boundaries define where the play area exists on the map. Kill Boundaries define where off limit areas are at. But these boundaries are invisible to the players. Quite often a map is bound by the walls and even a ceiling. In those cases, the walls and ceilings act as obvious boundaries to the map. But what if the map doesn’t have a fully enclosed boundary? What if there are no walls or a few walls? How would the players know the boundaries of the play area? This is where you want to use some sort of visual cue, a boundary marker, to suggest to the players that the marker is a boundary to the play area. There are two features that would clue the player that they are looking at a boundary marker, regardless what you use (you could use a pole, a rock, a small block, etc., whatever looks good with your map’s Architecture and Theme). Firstly, the marker will look purposefully planted, yet not a real part of the playable area – it will look like a boundary marker. You should try to make the marker look as natural and reasonably expected on your map as you can. But there are simply cases where you will be signalling so strongly the edge of the map that it will have some effect on the player realizing they are on a map. This mini break in immersion can be mitigated by making the boundary look as natural to the surroundings as possible – like they really are in no way out of place at all. Second, there is nothing beyond the markers. The biggest clue that they are looking at the marker is that the marker itself represents the outer most forged object on the map. A fence, a string of rocks, things that stretch and can rise no more than chest high can serve as a marker, because when they look over or around it, they see nothing else. Additionally, you want to use the flavor of boundary that allows them to step past the marker and into an out of bounds warning zone. The other flavor is an instant death zone, but those are never to be used to indicate out of bounds. Their only purpose is to speed up the spawn cycle, and are properly used exclusively when a player falls so low below the map that they cannot return to it. Typically entering into one of these sudden death zones is accompanied with the caption or voice track, You fell to your death. Visual cues are readily discerned from a distance so long as they remain consistent across your map. For example, visual cues indicating doorways should always be used in the same way. What appears as a visual cue for a doorway in one end of the map should not be used for any other purpose anywhere else. I wrote an article, Forging An Illusion, in which I talk about how one needs to bend perception by exaggerating features so that players see what you want them to see, even though you really can’t forge it correctly. Visual cues can be forged that stand out and grab a player’s attention to see in your forge work what you want them to see. This entire concept is heavily artistic and I really don’t want to get into the subject here, other than to say that what you forge in the way of visual cues can help draw your players into a Theme more effectively. Visual cues can help players learn to navigate your map faster, and the spawn locations of weapons. They can also help identify the boundaries of your map. You can even use visual cues to bend the players’ perception into seeing Themes you want them to see that can help them immerse into your map.